PST Sport’s MUGAs (Multi-Use Games Areas) are designed for multiple sports, making it possible to incorporate a number of different sports on a single pitch. Multi-sport play areas are ideal for schools offering considerable benefits over the traditional concrete school playground. MUGAs are a great all-weather alternative to a natural grass playing surface. PST Sport’s multi-use pitches can transform a school’s outdoor space and can be used for football, hockey, basketball as well as a range of other sports. Having a single area that can be used for a combination of sports is a great asset for a school as it caters for all sporting interests and allows kids to be more active by providing a clean, low-maintenance play area for year-round use. Multi-use pitches make the most of the available space and provide a long-lasting and safe place for kids to play. The project can be 100% tailored to your needs to utilise the space you have available more efficiently. We will work with you to develop a complete turnkey solution including design and planning, pitch construction, groundworks, drainage, fencing, netting and floodlighting. If you have a project you would like to discuss CONTACT US today. We normally advise that the surface you choose should suit the sport that will be played most often on the artificial grass surface. 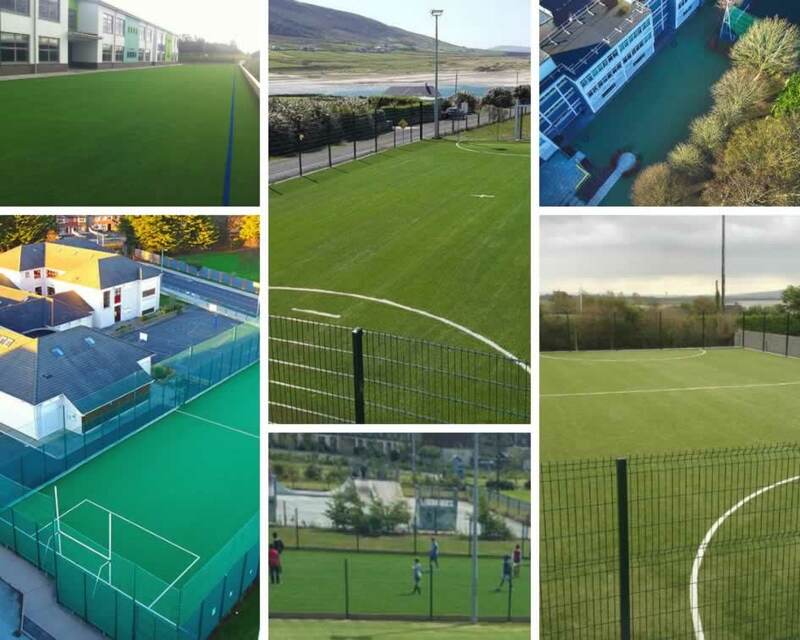 Pictured below: Recent artificial grass multi-sport pitches for schools around Ireland. Clockwise from top left; Gaelscoil an Chuilinn, Tyrrelstown, Co Dublin; Coláiste Chomáin, Ballina, Co Mayo; Holy Spirit National School, Ballymun, Co Dublin; Spa National School, Tralee, Co Kerry; Galway City Council & Gaelscoil Naomh Pádraig, Lucan, Co Dublin.